Bon Vivant Gourmets - Pasion del Cielo - some of the best coffees in the USA. Whenever possible, it is always preferable to support local community endeavors and small, often family owned businesses. This is where the heart is and more often than not, you'll find greater attention to detail, higher quality goods and services, and a Bon Vivant flare for life. 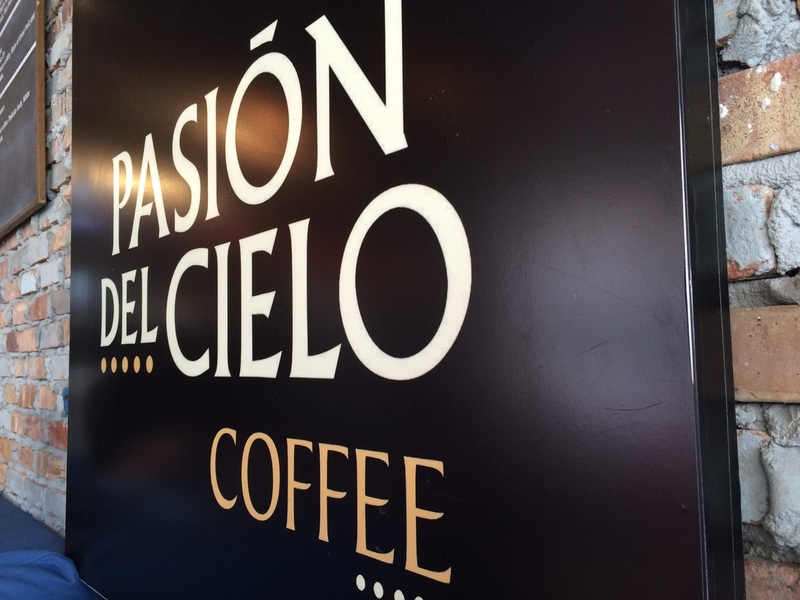 One such business is Pasion del Cielo Coffee. If you just need to take a hit and get that fix, it is more likely than not that your hotel, office, or home can facilitate that need - but that's kind of like calling water a drink. However, if you want real coffee, the stuff of legends and written about in history books - then this is the place. It is extremely easy to find, just off the Miracle Mile (Coral Way) and a block north of the Westin Colonnade Hotel (our next publication). We asked the porter at the Colonnade for advice as we wanted to try some authentic Cuban coffee - he mentioned we could acquire some down the street at this location but that we would truly be missing out on what they specialize in - amazing coffees! He listed a few but insisted his favorite was the Hawaiian Kona. Realizing that we still had a week in southern Florida, we knew there would be plenty of opportunities to acquire Cuban coffee and did not want to pass on the opportunity to try the Hawaiian Kona - perhaps one of the most exquisite and rarest coffees in the world. As we were waiting for the barista to perform their magic, the aromas filling the room reminded us of the purity of our first coffee experiences. For one of us, it was a sunny morning, sitting at a kitchen counter with all the windows open, birds chirping outside, in Provence, while their French host prepared an authentic Cafe au Lait: first heating the milk on a gas stove while waiting for the traditional espresso maker to start making its spurting sound - an indication that it's task is complete - and a bowl being placed on the counter directly in front of them. Shortly after the spurting, the Carte Noir Arabica espresso poured from 6 inches above the bowl, forming a perfectly smooth gently flowing arch that filled half the bowl. Then, in similar fashion, the gentle immersion of steaming hot whole milk: The black espresso swirling into brown from the sides of the bowl as the natural blending rose right to the rim! Lastly, two sugar cubes. The beautiful aromas emanating from that bowl were identical to those filling the Pasion del Cielo room. Gently and ever so carefully holding the sides of the bowl; raising it slowly so as to not burn one's fingers should an inundation occur; it is pressed to the lips. At the first sip of that French Cafe au Lait, a warm, creamy, rich chocolate filled the mouth followed by a subtle sweetness - such a powerful flavor! Pausing to appreciate that moment, more birds chirped outside and a soft breeze flowed over the counter. Nearly half finished, an extremely strong tingling sensation filled the head and when the bowl was empty, extreme dizziness caused such a loss of equilibrium that the stool slipped and nearly caused a face-planting on the floor! An addiction to perfect coffee was born. The barista raised his hand indicating our Hawaiian Konas were ready. There was a cute swirl in the light foam and apparently they do a different design in each order - an added touch to promote the local artist program (see below). We nearly treated our Konas as if they were wines: inhaling deeply and letting the aromas fill our minds. At the first sip, it was almost exactly as if we were transported back in time to our first experiences - there was a strong and very distinct chocolate flavor to the coffee, very smooth in texture, with a very rich and powerful body. The flavor was absolutely intense! Struck with the emotional impact of having perhaps one of the best coffees of our lives, we just starting laughing and out-crying, "WOW!" A lone gentleman sitting nearby (partially pictured above behind the coffee cup) smiled, looked over and without asking us what we were drinking just stated, "That's Kona." The large room is very warm and welcoming with very high ceilings, large windows, large, plush, comfortable sofas and chairs and a staff so friendly that it makes simple politeness seem almost rude. They are also extremely knowledgeable about their coffees so don't be shy to ask any questions. Each month, they ask a local artist to present their art, which can be found on the walls and dangling from the ceiling. Even their light fixtures are designed by local artists. And of course, they ship anywhere in the United States.